I am poised with my Nikon 600mm f/4 AF-S lens, TC 14e teleconverter and F5 camera body 30 feet from a beautiful, breeding plumage Arctic Tern nestled on her eggs. The warm glow of 10 p.m. light has both the tern and the surrounding tundra vegetation bathed in spectacular, rich light that creates a scene perfect for photography. I have already made over 100 exposures of this bird on its nest, but I am waiting patiently for the moment I know is coming. It happens when the tern leaves its nest to chase off a Long-tailed Jaeger that has been patrolling the area and has just crossed into the tern's "no-fly zone". When she returns to her eggs, the shutter on my F5 is flying at eight frames per second and I have shot an entire roll in less than five seconds. My aim is to capture the moment when the tern, with its beautiful, long, pointed wings outstretched above its body, settles back on the nest--the perfect ending to just another day of photography on the Arctic tundra. During the summer of 1999, I was fortunate to spend three full weeks photographing Arctic nesting birds on Alaska's Seward Peninsula at the height of the breeding season. The photo opportunities in the Arctic can be incredible during the short, hectic summer breeding period that runs roughly from the first week of June through mid-July. This is the best time to visit the Arctic for bird photography because the birds are in their spectacular summer breeding plumage, there are plenty of species to choose from and many of the birds can be easier to approach than at any other time of year. If you have never visited the Arctic, you might expect to just find a vast wasteland of lifeless tundra and taiga habitats. However, on the contrary, you will encounter a rich and beautiful landscape full of life that holds many great photo opportunities for those willing to make the effort. At a number of Arctic hotspots like Churchill, Manitoba, Canada, Nome, Alaska and Barrow, Alaska, you can find fantastic photo opportunities for a surprising variety of bird species during the summer breeding season. Many birders and photographers think of the Arctic as a great place to see Polar Bears and shorebirds but perhaps not much else. Well depending on where you go, you can also find and photograph loons, grebes, cranes, swans, geese, dabbling ducks, sea ducks, jaegers, gulls, terns, hawks, ptarmigan, owls, woodpeckers, swallows, thrushes, warblers, sparrows, finches and many more. 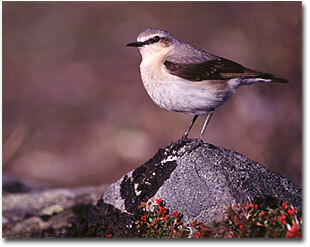 Furthermore, if you travel to western Alaska like I did that summer, you can also hope to see and photograph some unusual birds like Bristle-thighed Curlews, Bar-tailed Godwits, Yellow Wagtails, Arctic Warblers and other species whose breeding ranges just barely stray across into western North America from eastern Asia. For successful photography in the Arctic, it is best to live by the old Boy Scout motto--"be prepared". Photographic conditions in the Arctic can be harsh at times for a variety of reasons so both you and your photo equipment need to be prepared for changing conditions. Arctic weather conditions can change from one day to the next. You should try to prepare for any and all of the following; cold, heat, rain, wind, sun and bugs. On cold days in early summer, the temperatures can get into the 40's and on the warmest days, later in summer, the temperature can reach 80 degrees Fahrenheit. Therefore, dress appropriately. This means dressing in layers and have protection from the elements. Also, because so much of the tundra is wet, you will find that waterproof outer clothing can really come in handy because at times you are likely to kneel or sit down on the tundra to set up for photography. To find photography subjects on the Arctic tundra, you should expect to do a fair amount of walking. You will need appropriate footwear that is comfortable for long walks. Because the tundra is often wet and boggy, I have found that knee-high rubber boots are usually enough to keep my feet dry. If you think you want to wade deep in tundra ponds after birds, then you might consider chest-waders, but for the most part, I don't really feel they are a necessity. Another very important consideration for any photography trip to the Arctic is the battle against the bugs. When the weather is relatively cool and breezy, perhaps with temperatures around 60 degrees and below, you usually won't have too much of a problem with insects. However, when the sun begins to shine, the wind dies down and the temperature reaches 65 or 70, you should expect, and be prepared for, incredible swarms of newly hatched mosquitoes and black flies almost anywhere in the arctic. If you aren't prepared for this sudden insect invasion, your photography won't be much fun as you try to fight off the bugs. All you really need for extra protection from these conditions are a simple headnet and gloves because the rest of your normal clothing should be heavy enough to keep most insects from biting you. You may also find it helpful to spray your outer clothing with an insect repellent containing DEET just to help reduce the number of insects that buzz around you as you photograph. Photo equipment for a trip to the arctic doesn't have to be anything out of the ordinary. You'll certainly want a long, fast telephoto lens like a 500mm or 600mm f/4 for a majority of your shooting. There are lots of small subjects to shoot in the arctic, so it would also be wise to bring a 1.4X and 2X teleconverter and a set of extension tubes if you have them. A medium range telephoto in the 80-400mm range may have some value for flight photography, but I wouldn't call it an absolute necessity. A short zoom lens for macro and/or scenic work can prove very useful. A flash to be used mostly as fill is worth bringing and taking a sturdy tripod and head goes without saying. Three other things I would highly recommend you consider are a second camera body as a back up in case your first body fails, a lightweight, camo-cloth, throw over type blind and as much film as you possibly can carry. You will be far from home and far from anyplace you can get film quickly and cheaply. Plan to shoot at least 10-20 rolls a day. I then would tell you to add 50-100 more rolls for the whole trip on top of that! When the shooting is good in the arctic, the last thing you want is to be worried that you have to budget your film consumption. The summer days in the high Arctic are extremely long. Depending on latitude, what passes for sunrise may come at two a.m. while what is supposed to be sunset may not come until midnight or later. Therefore, you need to pay special attention to how you schedule your days. I know from experience that it is very tempting to start your photography day at four a.m. and then stay out until midnight with hardly a break all day. If you keep a schedule like this you will quickly get burned out and the photography will become a chore. I'd suggest you start fairly early, say five or six a.m. after a good breakfast, take a break or a nap in the middle of the day and then have an early dinner and go back out in the late afternoon and evening. This schedule can give your body a chance to catch up on rest. It also affords you an opportunity to do maintenance on your photo equipment in the middle of the day and it should put you in the field at the time of day when the light is the best. Of course the real attraction for bird photographers visiting the Arctic tundra are the incredible photo opportunities of nesting birds. There is a spectacular variety of birds to photograph and chances are you won't get to work on all of them on a single trip. The shorebirds are probably the easiest and most common birds you will encounter so expect to come home with lot of great photos of them. 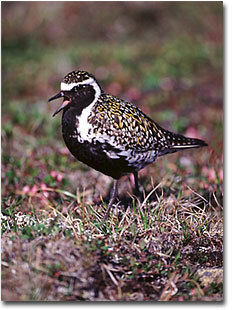 By late June, the tundra is carpeted with beautiful wildflowers and the shorebird broods are beginning to hatch. It is during this time that the adults can become very approachable for photography. Anyone visiting the Arctic for photography must make the welfare of the birds their number one priority. By following some common sense advice and putting the welfare of your subjects first, you should be able to both get the photos you want and not harm the birds. My good friend, fellow WildBird advisory board member and veteran Arctic bird photographer Kevin Karlson wrote an excellent guide to photo ethics in the Arctic in the June 1998 issue of WildBird (page 52). I'd like to paraphrase some of what he wrote here. "The Arctic environment is fragile. 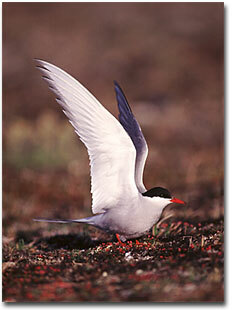 It is important not to cause undue stress to nesting birds because they might abandon their nests. Flushing a bird from the nest can expose the eggs to cold temperatures or give predators an opportunity to steal eggs or nestlings. Take care when walking on the tundra because many birds and nests are extremely well camouflaged and you don't want to step on them. Be especially careful walking along dry ridges and hummocks because this is where many shorebirds and waterfowl build their nests. If you find a bird on a nest you don't want to get too close because nest predators like foxes and weasels can follow your scent. To safely photograph birds around nest sites, you should only use long telephoto lenses." Much of the Arctic tundra is still wild and pristine. There are still thousands of square miles of land that have rarely been visited by humans. Fortunately, there are a number of places where birders and photographers can find enough modern conveniences to make a trip to the high Arctic both affordable and comfortable. My first trip there was a photographic success beyond my wildest dreams but more importantly, it was a rewarding opportunity to experience a landscape that I will never forget. I think what says it best for me is that I am already counting the days until next summer comes so I can get back to photograph more spectacular birds on the Arctic tundra. Comments on this article? Send them to the editor.